Well, at almost the last minute, DST was cancelled in Argentina this year. And this broke things, mostly computers. (Not for the first time either, the same thing happened two years ago here). The debian folk came out with a fix at the last minute: so that fixed the linux machines, but OS X is a slower beast to move, so it’ll be a while before any change works its way through. In the meantime, Mac users in Argentina are left with broken clocks. Argentina_DST_Update_2.pkg – for 10.6.x only! I am no Mac expert, and this isn’t entirely tested, so be warned. (i.e. just two words to change). If it makes you feel better, here’s a diff. The sudo is necessary because you’re changing /usr/share/zoneinfo. (note that the timezone is now ART, not ARST as previously). And that’s it. We have a new ICU database. Reboot to see the changes. And you can simply copy the data/out/icudt40l.dat you created for OS X into /usr/share/icu/icudt40l.dat on the iPhone. It causes Springboard to crash, but after a reboot everything works perfectly. Update (10th November): I can’t believe it, today 10.6.2 update broke the damn icu stuff again. Thanks to Jonathan Tapicer for pointing out that the tzdata file name has been updated (now at version R). Argentina_DST_Update.pkg – for 10.6.x only! Download and install the new Argentina_DST_Update_2.pkg – for 10.6.x only! This is fairly straightforward: it disables automatic timezone detection, and sets the timezone manually (you can use the -listtimezones switch to see a list of available timezones). If anyone knows how to update DateAndTime.prefPane (which appears to use GeoKit) please let me know. Update (4th April 2010): I’m pleased to announce that 10.6.3 includes updated tzdata for Argentina (and elsewhere) that fixes all this silliness. Get it now (via software update) to make this problem go away. This entry was posted on October 18, 2009, 8:53 pm and is filed under Argentina, Mac, Phones. You can follow any responses to this entry through RSS 2.0. You can leave a response, or trackback from your own site. I am running windows and was wondering how to get the data/out/icudt40l.dat file to copy on my iphone. to copy the file across. I guess you could probably do something using the iphone sdk tools too. Wouldn’t know where to start there though. 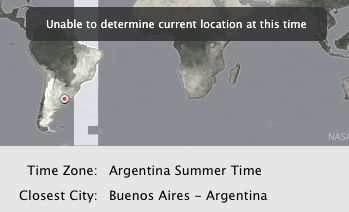 On 10.6 you could select Mendoza time which maps to ART (instead of ARST for Buenos Aires). Could you share the icudt40l.dat for my iphone? 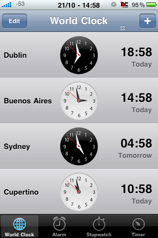 I need to fix my Argentina time but I don’t have MacOS. This is the one I compiled on my mac (and subsequently put on the iPhone). I’ve run all the commands and nothing happens. and all my calendar applications show the hour wrong. If I choose Mendoza (in 10.6.1 is GMT-03:00), like Adrian said, when I recieve an invitation from Buenos Aires TZ, it creates with 1 hour difference. BTW: I’ve copied the icudt40l.dat that you left for Lionel, but when reboot the finder relaunches constantly, so i reinstall the one that I’ve created. There are a few things you can check. If the md5 isn’t exactly the same, try downloading the file again. If these aren’t correct, you can fix them with chmod 0644, and chown root:wheel. Thank you very much for the file! Works perfect!!!! Hi, reading this post I cloud change time correctly. I’m new to MacOS, so please tell me what I have to do. You’ll need to download and install Xcode to compile ICU. Hi Bricky, thanks for your help. The strange thing is that I have wrong time only on the Menu Bar. Correct time is showed on my widgets and, on the zdump. Do you think I have to compile ICU? Is this the only way? I’m asking because I never compile a thing. Right now I’m downloading the Xcode (w/ iPhone sdk). I think this is what I need for my MacOS10.5.8. Can you send me the rights commands? Then I restarted my Mac and still have the wrong time. I don’t know what is happening, can you help me, please? The instructions above are for 10.6 Pablo, I’m not sure if they’ll work the same for 10.5.8.
if it says “No such file or directory”, or if the date on the file is wrong (not the date you compiled it), then that’s the problem. And proceed with the remainder of the instructions as above. I don’t know if it’ll work, but you may have better luck. Thank you very much! It worked perfect! I was looking for a solution since three weeks. Sorry for bothering but I’m having this huge problem and I don’t know how to fix it. I read your instructions but I’m not familiarized with these sort of codes. All the instructions I need to type them in “Terminal” at a time? I’ll be very thankfull if you can help me with this and sorry for my ignorance. I’ve packaged this up as an installer Gon, try that. I really don’t know how to thank you. It works perfect and it was very extremely simple. THANK YOU VERY MUCH!!! Dude, you rock! I’ve been struggling with this for a long time… I owe you a chilled Quilmes, at the least! que loco, apple sigue con este problema en ipad, iphones, ipod touch, habra alguna manera de pedirles que lo actualizen en iOS 4.3 ? try it on one of my servers, 10.5.8, and i only can use ICU-8.11.4.tar.gz woks perfect, remains iphone, ipad, etc without jailbreak!